Wide Format Repair & Maintenance Services - Print-O-Stat, Inc.
Our knowledgeable staff is factory trained and certified. We maintain an extensive inventory of parts in our locations as well as in each technician's vehicle. By having eleven electronically dispatched Service Technicians strategically located throughout our geographic area, we can provide timely, top quality service, at competitive prices. 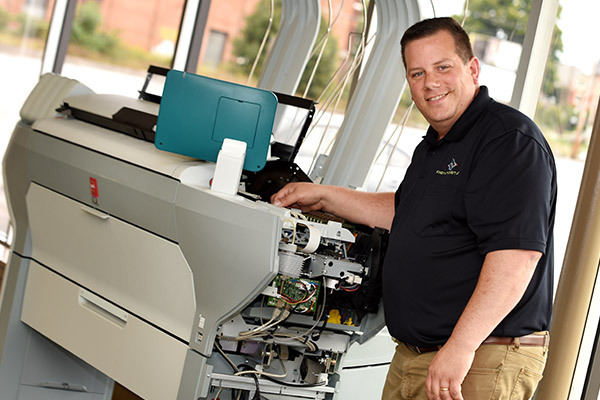 Print-O-Stat's Technical Support Department offers a variety of services before, during, and after the sale. Our Systems Analysts will work with you to ensure your network configuration and software applications are performing at their optimal levels. If your machine goes down we'll make sure your deadline is still met while our certified technicians service your machine. You can count on our trained and certified service team to quickly support you when you need it the most. Whether it's an urgent matter or a routine maintenance check, our service team is here for you.